MacBook Air is one of the best laptops from Apple. This laptop has various interesting features that make anyone want to own it. 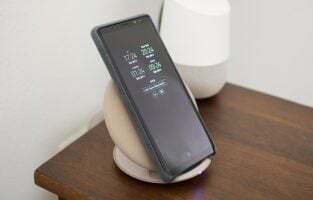 The key highlight is the 12-hours battery that allows you to work unplugged all day long. The choice of processors that contribute to its fast operation is another noteworthy feature. Another aspect that you cannot overlook is that the laptop is lightweight and very thin making it easily portable. 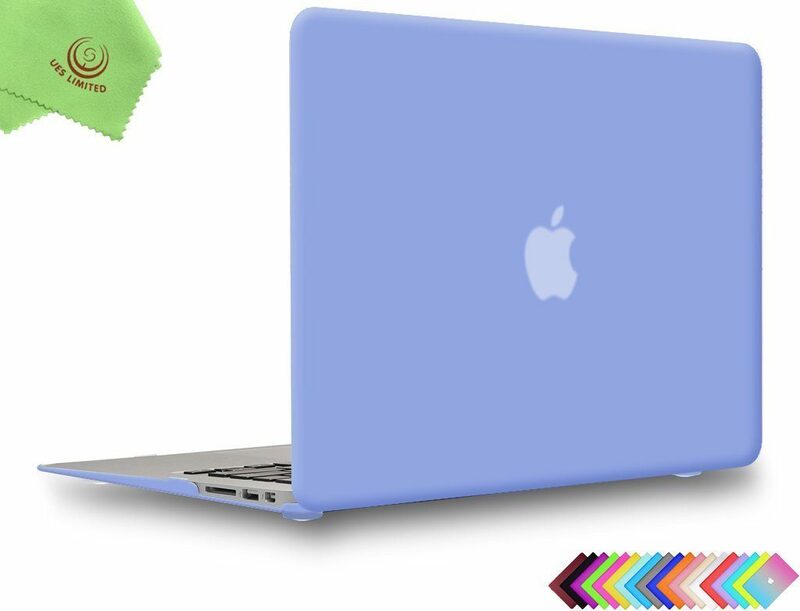 Although it comes in the standard silver color from Apple, you can opt for many colorful cases to make your MacBook Air stand out from the rest. You can take your pick from a range of sleeves and pouches. 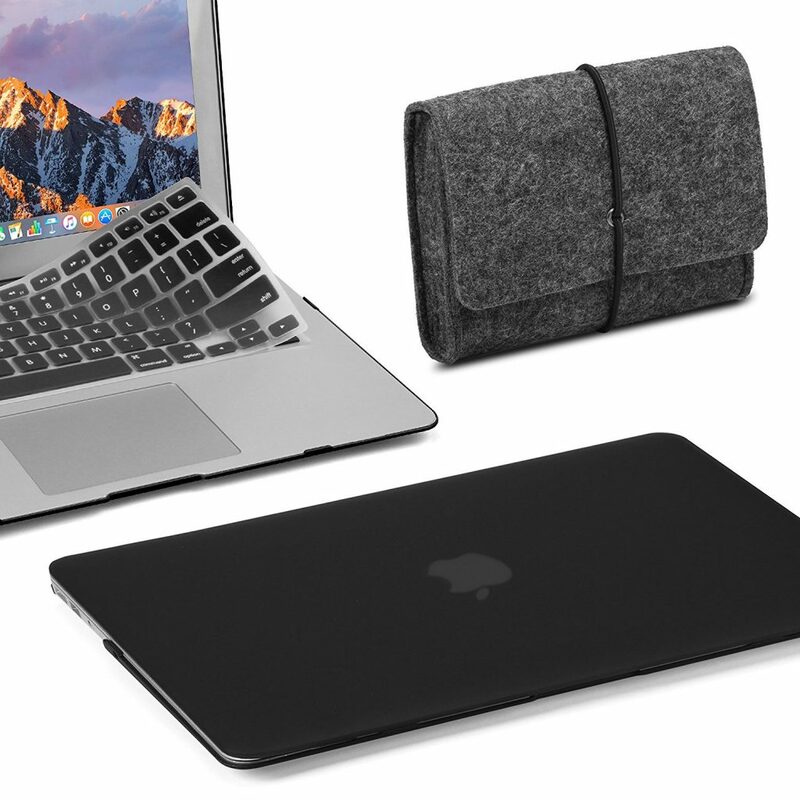 Here are some of the best MacBook Air cases and covers. The TOP CASE is ultra slim and lightweight just like the laptop. However, the case is very durable because it is made of rubber. This gives the MacBook Air long-lasting and complete protection preventing the occurrence of accidental scratches and hard knocks. The case has a snap on and off design that allows you to put it on and take it off very easily. There is no need to remove the case to plug in the charger. The matte finish case also offers complete access to all the features and buttons. It offers complete ventilation to make the laptop stay cool always. The accessory comes with a replaceable silicone stand attached to it. The hard case is available in 21 vibrant color options. It comes along with a keyboard cover skin of the same color and a graphic mouse pad with the logo of the manufacturer. The TOP CASE accessory is the right choice for people who want a rugged case that prevents scratches and dents on the laptop. The case is a good option for people who are looking for various color options to make their MacBook Air stand apart from others of its kind. This heavy-duty case assures you of complete safety of your laptop. The NexCase is engineered with beveled edges and shock-absorbing ridges. These features ensure that the case offers the laptop complete protection and secure fit. The snap-on installation functionality makes it very easy for you to put on and remove the case as per your convenience. The cooling vents offer free air flow that prevents heating up of your MacBook Air when it is being used for long hours. 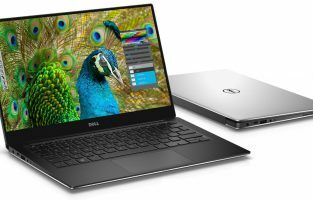 The case has an inbuilt screen protector and 360-degree functionality that safeguards the entire laptop, including its screen, from scratches. The accessory offers complete access to all the controls and ports of the laptop without having to remove it. The case has two layers for extended durability. It comes in four color options of black, green, blue and pink. The heavy-duty feature makes the NexCase cover the best bet for people who do not want any compromise in the protection of their laptop. 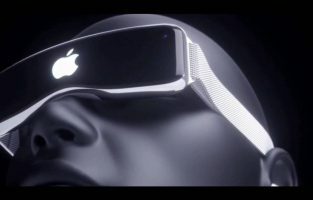 The frame-like appearance accessory is worth considering by those who want their case to look from other normal cases. This iLeadon accessory is a two-piece case with one piece for the top part and the other piece for the bottom part. The ultra-thin case has a simple clip-on/off mechanism with two clips each at the top and the bottom for easy fastening. The case is made of durable plastic and has a rubber finish. The bottom case is vented for maximum air circulation. 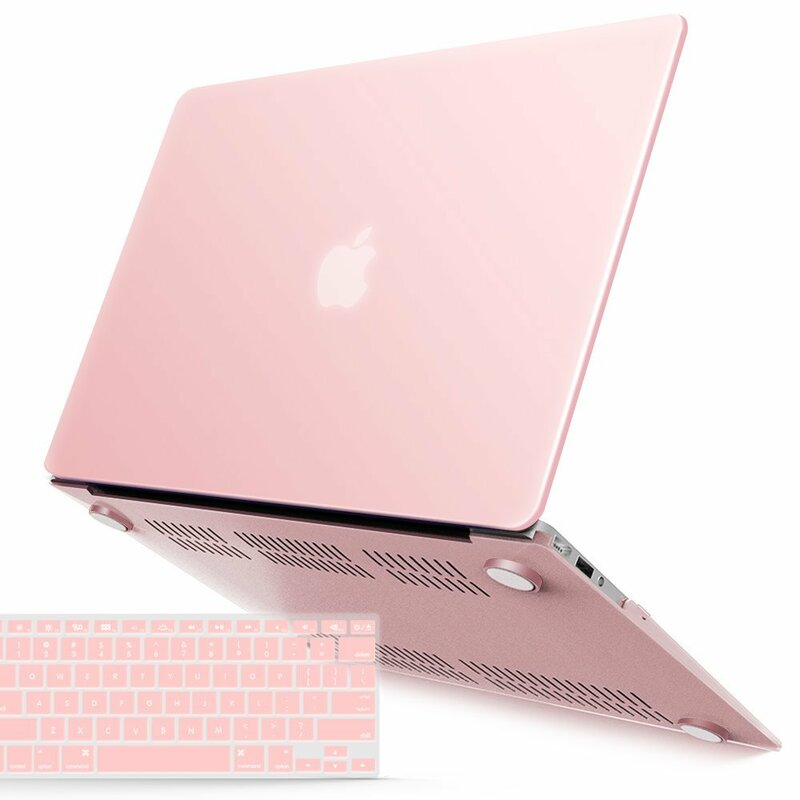 It has four anti-skid feet to prevent your MacBook Air from slipping when you put the case on. There is no need to remove the case when you plug your headset, USB cable or charger. The case offers drop- and shock-proof resistance. To put the case on, slide the laptop into the bottom case and press the tabs till they fit securely in place. Next, keep the laptop half open with the Apple logo facing you. Place the top case over the laptop and clasp all the tabs until they provide a firm fit. If you want to remove the bottom cover, leave the laptop half open with the air fans in your direction. Pull the snaps off from the corners focusing on one side at a time. The case comes in eight distinct designs with a matching keyboard cover. 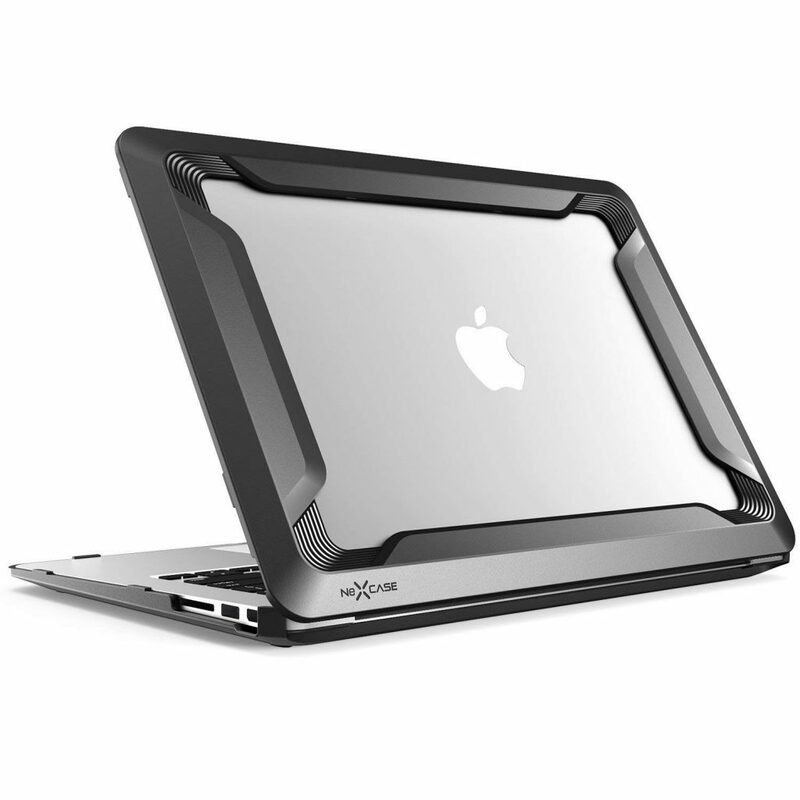 The iLeadon case is ideal for people who want a thin case to avoid their MacBook Air from sporting a bulky look. The different color options are a good choice for those who want covers of different themes like floral, mural art and world map. This lightweight accessory features a two-piece design with two separate pieces for the top and bottom. 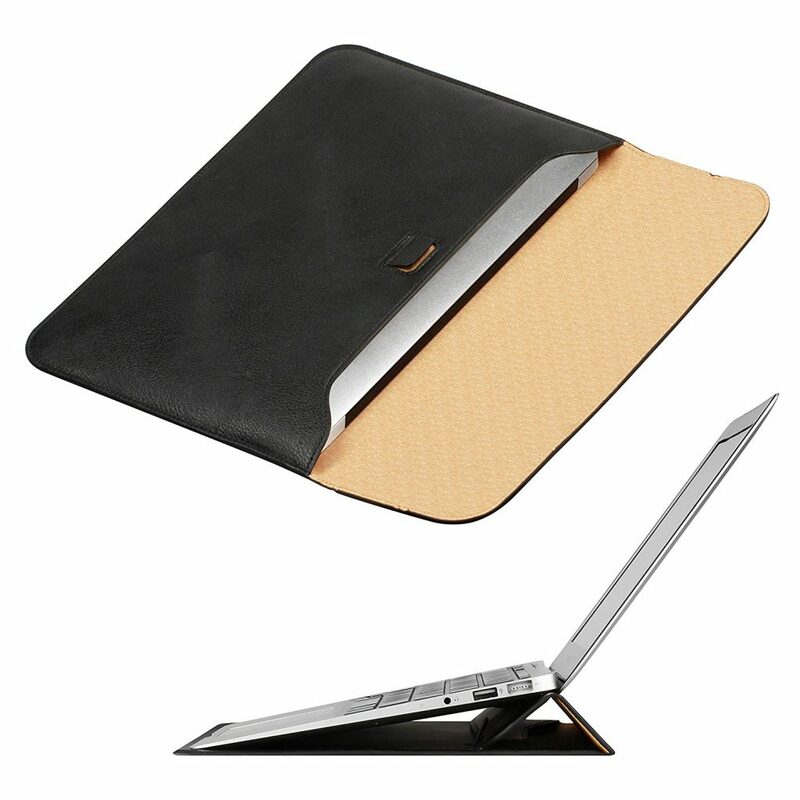 The vented bottom shell ensures maximum heat dissipation and prevents the laptop from getting heated up when in use. The clip-on/off mechanism of the iCasso case makes it easy to fasten and remove the case whenever you want. The case contains precise cutouts for you to insert your headset, charger and cable without having to remove the same. It features four rubber feet to stop the laptop from skidding when you place the MacBook Air on any surface. The Apple logo shines dimly through the case when you turn the device on and the screen is bright. The case is made of hard plastic polycarbonate and has a rubberized coating with a glossy finish. It is available in seven different themes for the top case with matching cases for the bottom counterpart. The iCasso case is worth giving a thought by people who want their MacBook Air to be durable, as well as look classy at the same time. The accessory is ideal for those who want to make their choice from a wide range of patterns in both light and dark colors. The Unik Case Macbook Air case comes with a strong polycarbonate body with a rubberized coating. This ensures that your laptop is highly durable and offers it ultimate protection from multiple factors such as spills, dirt, scrapes and scratches. 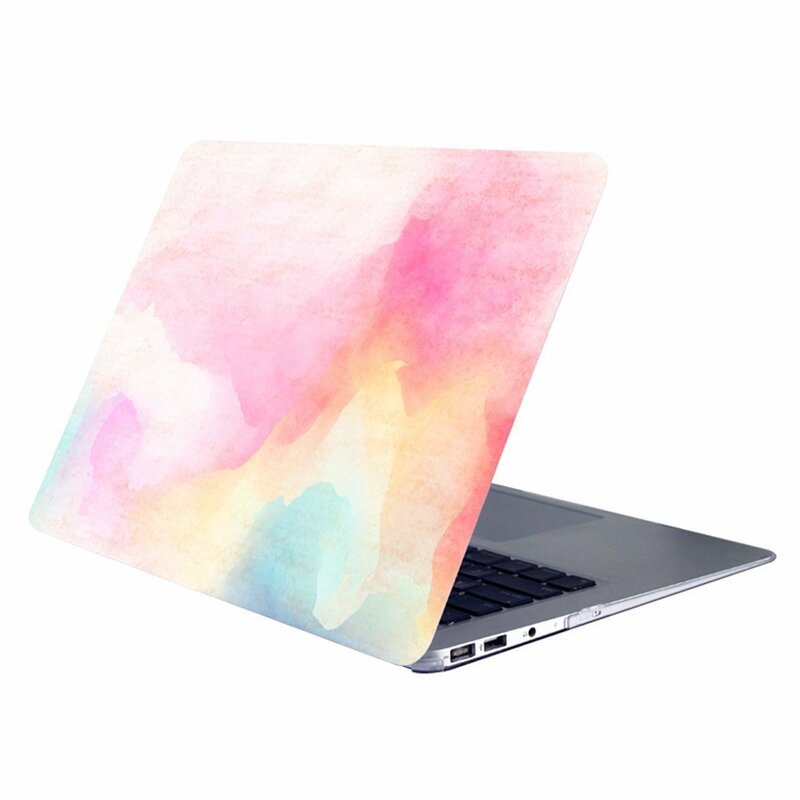 The case features a stylish triangular galore gradient Ombre design on the top panel. The Apple logo is clearly visible through the design. The lightweight ultra slim accessory offers access to all the ports in your MacBook Air. 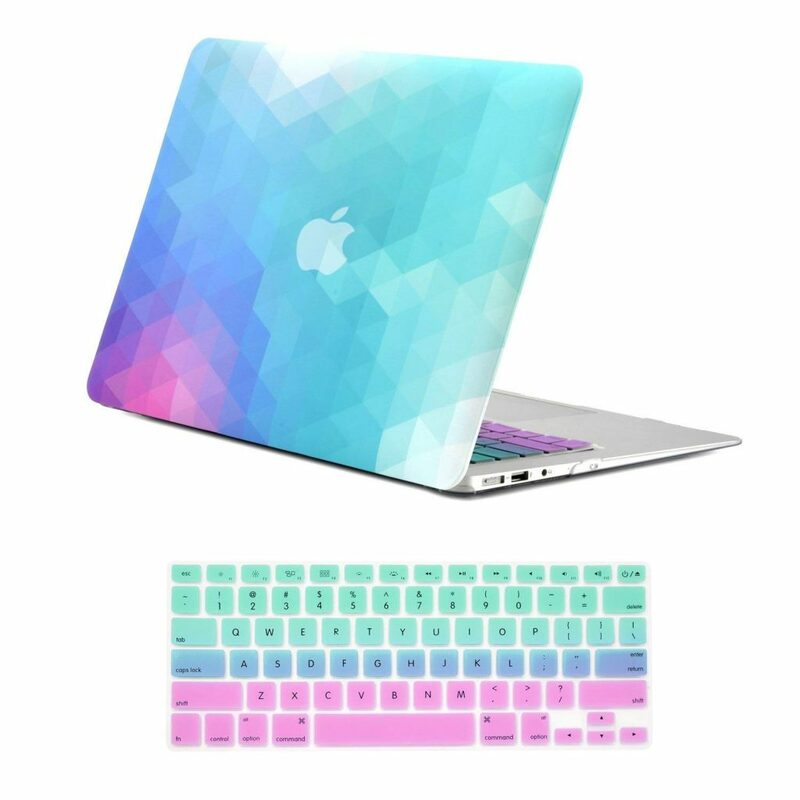 The hard-shell case comes in three color choices of purple & light blue, green & pink and red & white. It comes with a matching Fade Ombre silicon skin cover. The Unik Case hard case is a good option for people who would like the Apple logo to be visible through the pattern of the top panel. The accessory is ideal for those who love geometrical patterns better than plain cases or cases with designs on them. The KEC laptop case has a cutout design for the ports and separate top and bottom panels. The hard-shell case comprises a rubber oil paint coating. This gives the external surface of the laptop a smooth exterior rubberized texture and keeps it free of smudges, dirt, fingerprints and scratches. It also protects the laptop from falls and other such scratches. The two pieces are very easy to take off and put on whenever you want. The rubber feet assure you that the laptop remains steady on any mounting surface. The bottom panel features multiple vents to allow for air circulation and keep the MacBook Air as cool as possible by allowing maximum disbursement and heat dissipation. The lightweight design makes it easy to take the case anywhere with you in your bag. The Apple logo appears illuminated through the design on the top panel. It comes in 14 different patterns. The MacBook Air Case is ideal for people who want a lightweight case that does not make the laptop bulky after putting it on. The KEC case can be given a thought by lovers of astronomy as most of the patterns are related to space. The Canvas life MacBook Air sleeve has a simple design with a zippered top large pocket and a smaller side zippered pocket. The soft and comfortable sleeve is made of high-quality Oxford cloth that makes it easily washable. The waterproof pouch has an anti-pressure 210D polyester lining that features shock absorption functionality to prevent damage to your MacBook Air. The top zip opens wide to fit your laptop without any difficulty. The side zip helps you to keep your mouse, phone, charger and just about any laptop accessory. The sleeve comes with 12 options for the canvas print for you to take your pick. The Canvas life accessory makes a great option for people who do not want to carry their MacBook Air in the normal laptop carry bag. The sleeve is a good option for those who wish to be trendy like teens, students, business people and more. The plain MacBook Air Case has different levels of transparency depending on the color you choose. The Apple logo shines through the case when you turn the laptop on. The sturdy plastic material of the case ensures that the laptop is free of scratches and strikes. It comes fitted with micro clips to fasten the Lention device in position with an easy snap-on mechanism. The case also has four rubber feet that have the same color to prevent the laptop from slipping off the surface where you place it. It gives you full access to the various ports without blocking them. The case is available in five different color options of frost black, frost clear, frost green, frost pink and wine red. It includes a keyboard cover and plug ports of the same color to prevent dust accumulation and has a one-year warranty. The Lention accessory is a great choice for people who want to choose among different solid colors for their MacBook Air. The case is worth giving a thought by those who are apprehensive of their laptop not working properly because of dust accumulation. The BRAECNstock case for MacBook Air has a professional snap-on design that allows you to use and remove it very easily. The precise cutouts ensure that you can use all the ports without removing the case. It has two hard heavy-duty bumpers that protect the laptop from just about any mishap such as bending, dropping and shocks. The case has a foldable kickstand of the same color fitted on to it that allows you to keep the keyboard and monitor at better viewing angles without neck sprain. 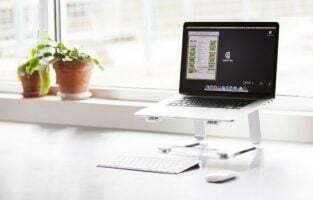 The stand also avoids overheating that often happens when you keep the laptop on a flat surface. The ultra-thin hard case is made of a combination of flexible thermoplastic polyurethane and hybrid hard polycarbonate. The case is available in six color variants of gray, khaki, purple, red, light blue and rose red. It comes with a user manual and a cleaning cloth. 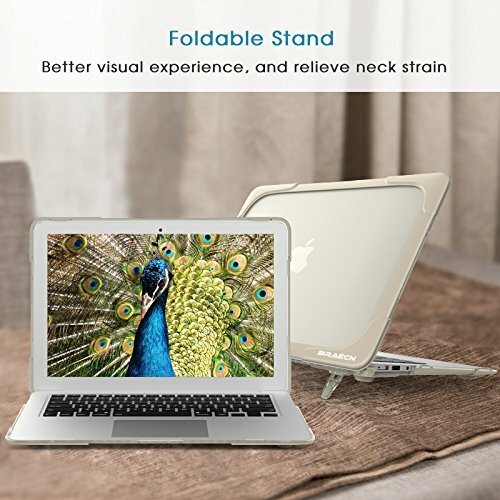 The foldable stand makes the BRAENstock MacBook air case a must-have accessory for movie and gaming lovers because of the better viewing angles. The case is a good option for those who do not want any compromise in the protection of their laptop. 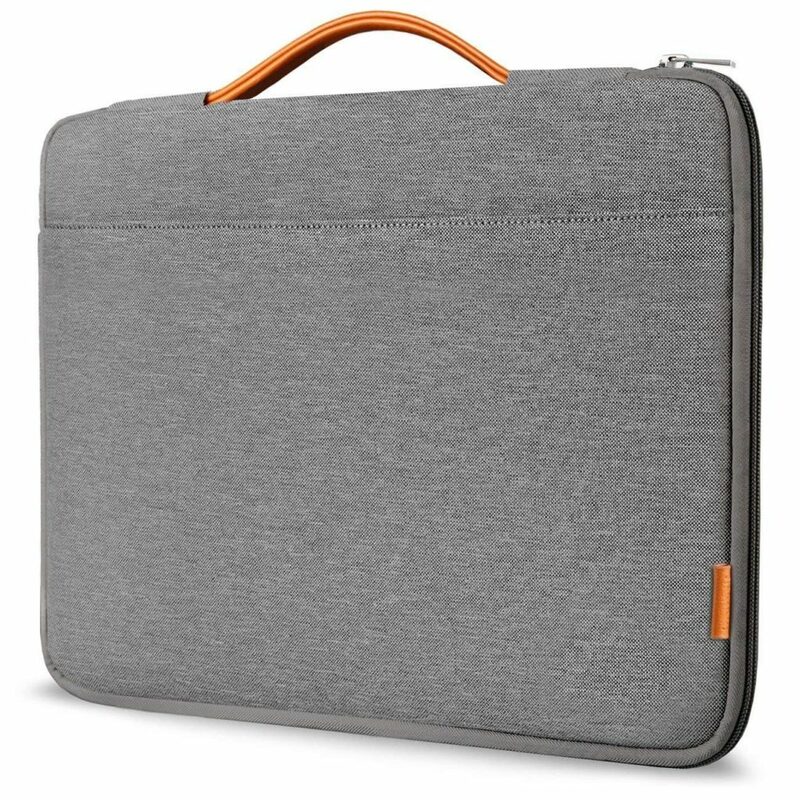 This stylish MacBook Air case has a side zipper to prevent the laptop from falling accidentally. There is a side pocket that is big enough to hold your laptop accessories and other items such as power charger, mouse, phone and more. The orange colored handle complements the color of the case perfectly giving it and gives it rugged look. The zip is of the same color as the external material. The two zippers feature allows you to charge the laptop when it is inside the case. The Inateck case is made of five layers of eco-friendly materials that make it capable of withstanding shocks and bumps. The outer wearable woven rough fabric along with the inner soft flannelette wear-resistant polyester fabric lining offers the laptop 360-degree protection and protection against accidental spills. The foam padding ensures that the case does not appear bulky while providing the required protection. It comes in two color choices of dark gray and black. This Inateck accessory is ideal for people who would like to flaunt a statement of style with an executive bag-like case for their MacBook Air. The case is a good option for those who are on a budget and do not want to spend much on fancy cases. The Ymix MacBook Air case is a set of two pieces with rubber oil coating. The smooth rubber texture makes the case free of dust, fingerprints and scratches. It also ensures that the laptop does not slip off the surface on which you keep it. The bottom case is highly vented so that there is as much air circulation as possible to allow maximum heat disbursement and dissipation. The four rubber feet fitted on the bottom panel also prevent the laptop from slipping. The case is made of Eco-friendly, durable, high quality and lightweight hard plastic that is scratch and abrasion free. It is very easy to put the case on and remove it from your MacBook Air when needed. There is no need to remove the case for plugging in your charger, headset and cable to the laptop. The high-quality images printed on the case retain their new look even after a long time. You can choose from 44 different images or patterns for the top panel of your case. The Ymix accessory is apt for people who want the images on their laptop case to look as good as new at any point of time. 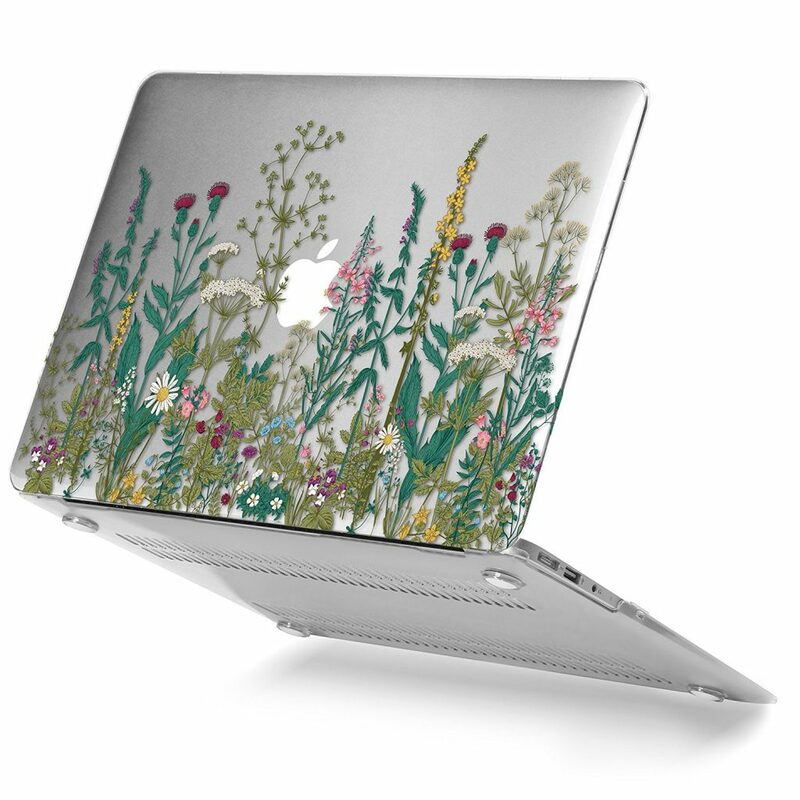 The case is worth consideration by those who prefer using MacBook Air cases made of eco-friendly materials. 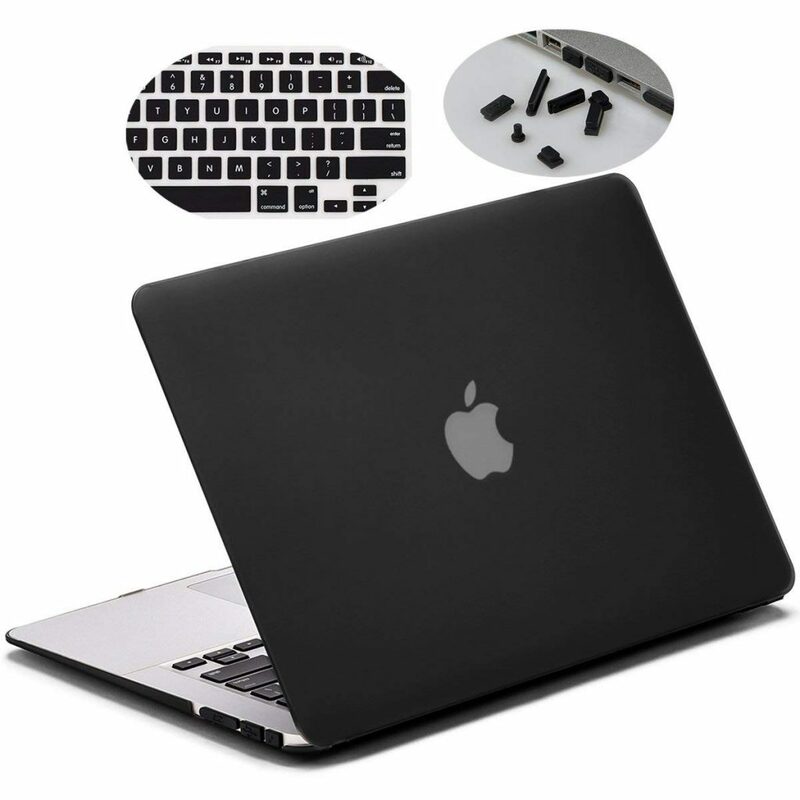 The Dongke MacBook Air hard protective case comes along with a silicone black cover. The Apple logo is visible through the 3D design when the laptop is turned on. During the day, the logo appears dark gray in color and pink at night. The gray 3D blasting creative design makes the laptop look beautiful and stand out from its counterparts. The unique design is printed using high-quality UV printing technology. The vented case makes sure that the device does not heat due to long hours of use. The snap-on feature allows you to fasten and remove both the top and bottom panels of the two-piece case with ease. You can use the charger, cable and headset with the case fitted on the MacBook Air case. The super lightweight ultra slim crystal cover is made of frosted plastic that prevents scratches and scrapes from forming on the case. The Dongke case is undoubtedly the right choice for people who love 3D effects. The case is ideal for those who want a case that is easy to put on and take off. The slim MacBook Air accessory offers complete 360-degree protection to your laptop with its two layers and shock absorbing materials that prevent minor bumps, scratches, shock and drops. The Evecase sleeve has a lightweight design that allows you to put it into a briefcase or backpack with ease. The top zipper of the impact and splash resistant sleeve opens out wide and has a smooth gliding action to allow you to take out and put the laptop back in comfortably. 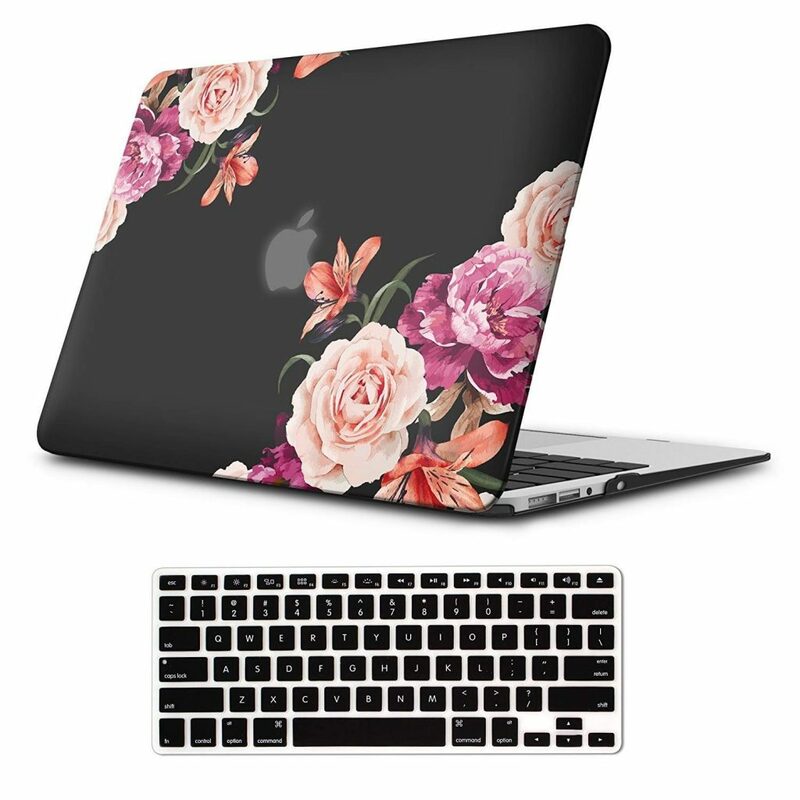 The outer layer of the accessory is made of high-density neoprene foam that offers the MacBook Air all-weather protection and has shock absorption properties. The inner layer is designed with extra thick plush microfiber with a foam lining for soft touch and prevention of accidental scratches. This layer also prevents dust accumulation on the laptop and keeps it clean always. The sleeve is black in color with a diamond pattern. The Evecase sleeve is the right bet for people who would like to keep their MacBook Air cover inside other bags. The accessory is a good choice for those who want a simple and easy to use a pouch with a stylish look for their laptop. The slim and lightweight Plemo MacBook Air case has a high quality durable waterproof PU leather outer covering that has water protection properties. This prevents the laptop and its accessories from getting wet due to accidental splashes and rain. 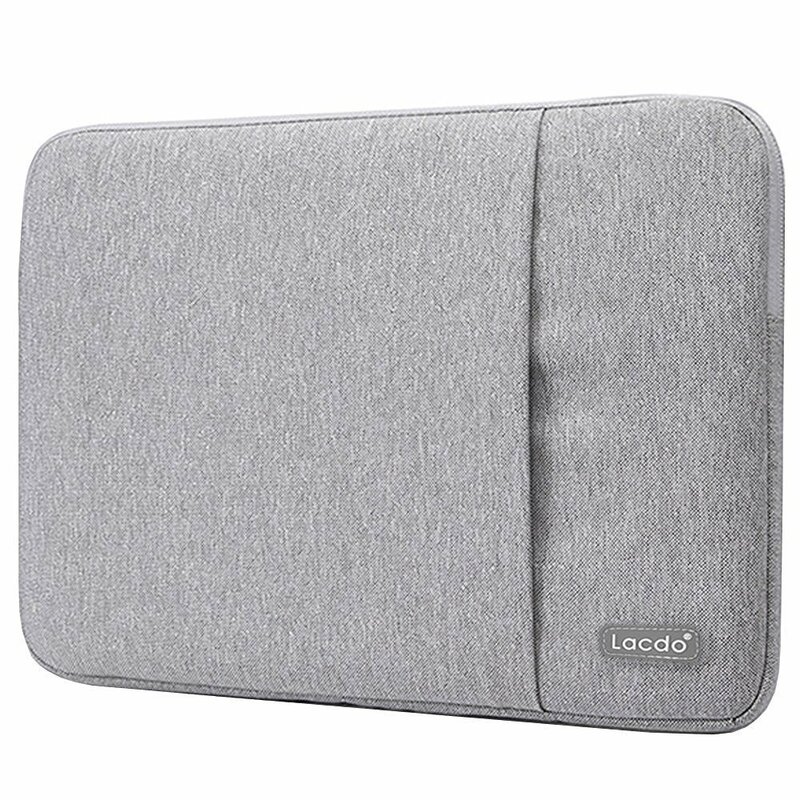 The inner lining is made of fluffy fabric that has shock absorption properties to protect the MacBook Air from accidental bumps and/or scratches, as well as lessens the damage to the laptop because of impacts. 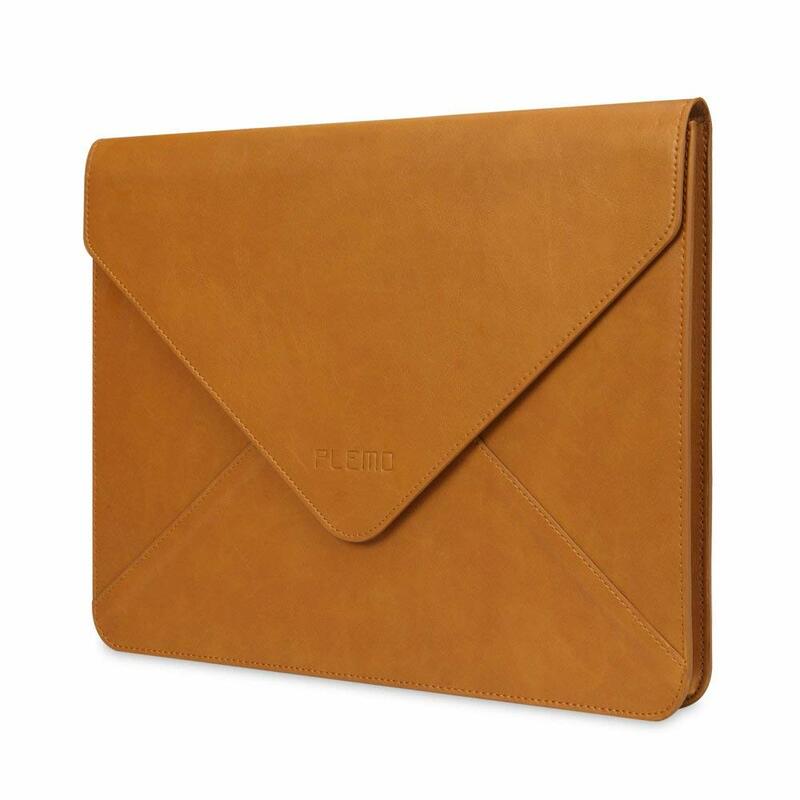 The brown sleeve comes with an envelope style design that allows you to take your laptop out and put it back in without any difficulty. This design makes the laptop look bulky and slides effortlessly into any bag or briefcase. 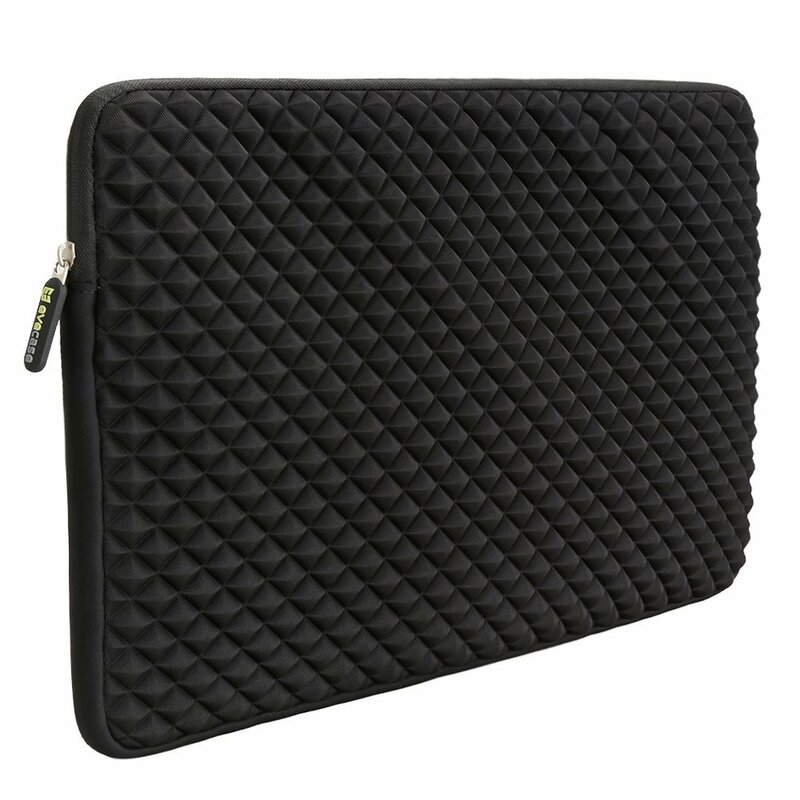 The case comes with a Velcro fastener to ensure that the laptop remains safely inside without slipping off. The MacBook Air case is a good option for people who are looking for a simple and sleek case to carry their laptop with them when they are on the move. The Velcro fastener makes it ideal for those who do not like the zip mechanism because of their apprehension of it getting stuck when opening or closing. 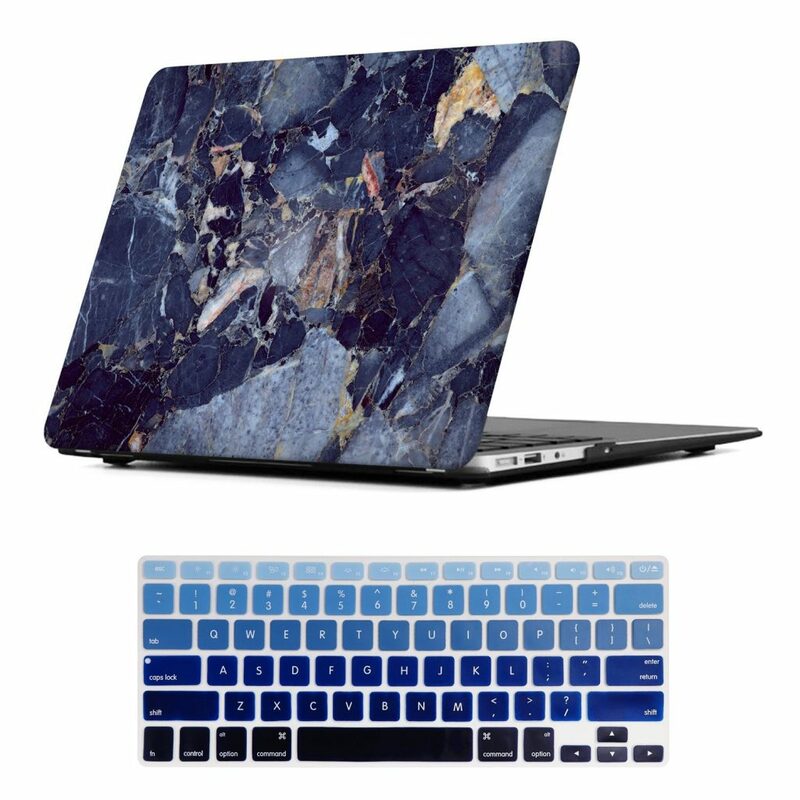 There are 37 different colors available in this hard case shell for MacBook Air. You also get a matching keyboard cover and a screen guard to protect it from dirt, dust or spills. The finishing of the product is flawless and fits the skin on your laptop. Every color has its own transparency. There are two rows of slots which help in getting rid of the heat quickly. The make of the case is polycarbonate which is quite flexible yet very strong and long-lasting. The sleek look of your MacBook Air isn’t destroyed if you put the case from iBenzer. It has a slim look and compliments the design of the laptop. 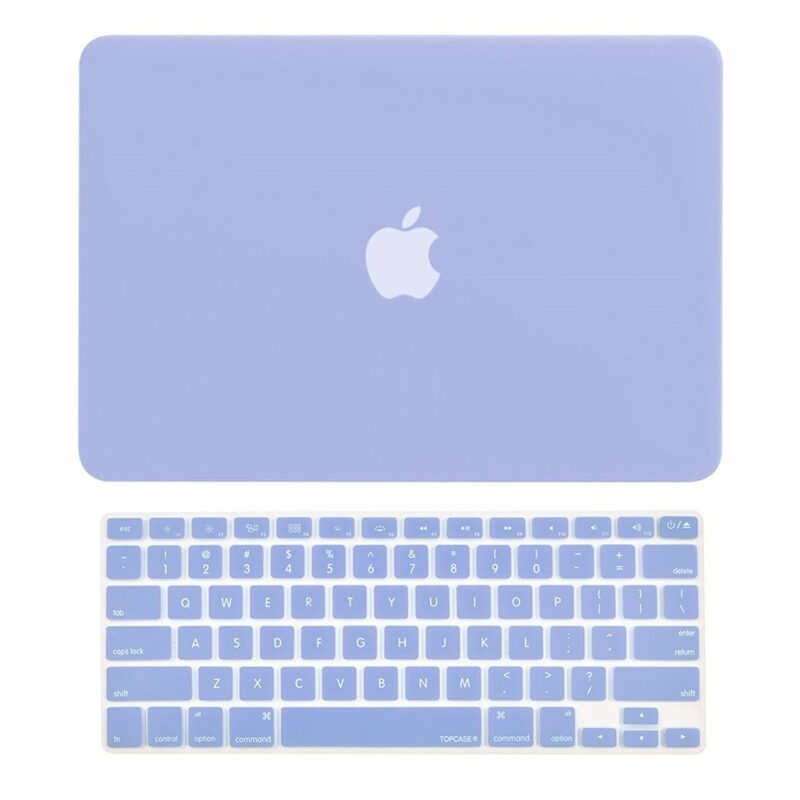 It is very light and made of durable plastic that protects your MacBook Air from scratches or scuffs. It has been cut precisely according to the vents and ports of the device. The bottom of the case also carries cutouts that are meant for the proper ventilation of the laptop. You get an option of 27 colors for this cover. This stylish laptop sleeve is made of waterproof canvas which keeps off water and vapor from your device. You can now take your MacBook out without having to worry about it getting wet. The lining of the case is designed to take all shocks, scratches and sudden impacts. The case has an added space where you can keep some documents or a file. 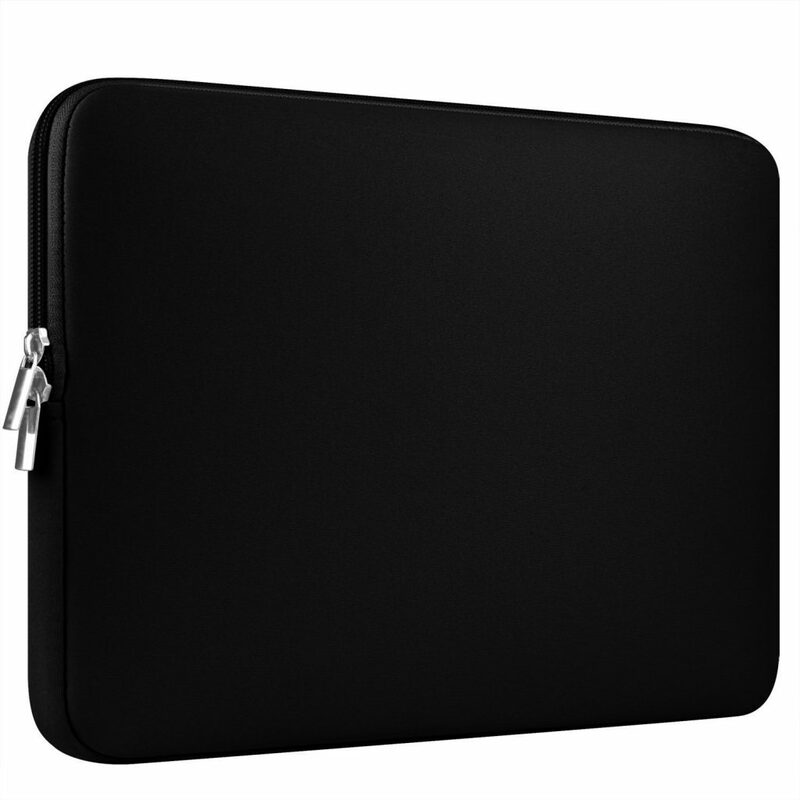 Your MacBook Air stays safe within the case as the zip secures it in its place perfectly. 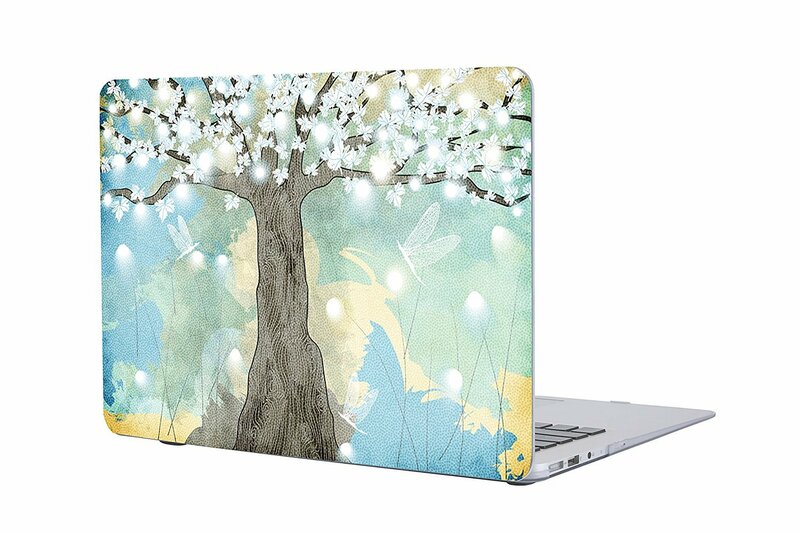 This is one of the most beautiful MacBook Air cases and covers to own. 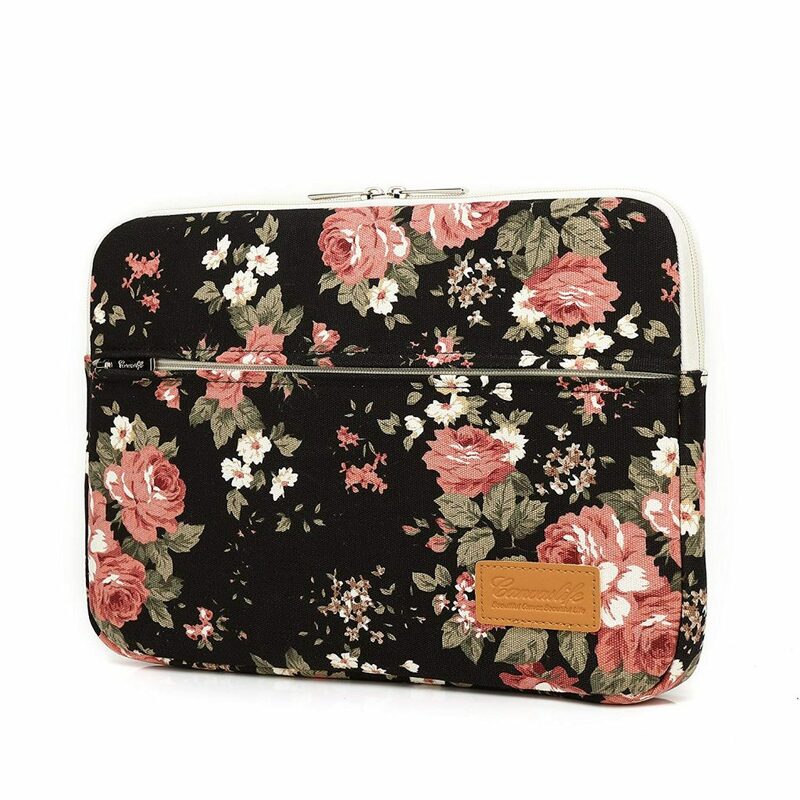 There are 40 different patterns that are available in this laptop case. Each one is attractive and unique. The case also includes a screen protector and a keyboard that protects your laptop from external damages. It is made of high-quality plastic rubber. There are proper openings for ports including one for the Apple logo of your MacBook Air. Ventilation at the bottom of the sleeve gets rid of the heat. There are anti-slip silicone feet also attached to this cover that keeps your laptop in place. 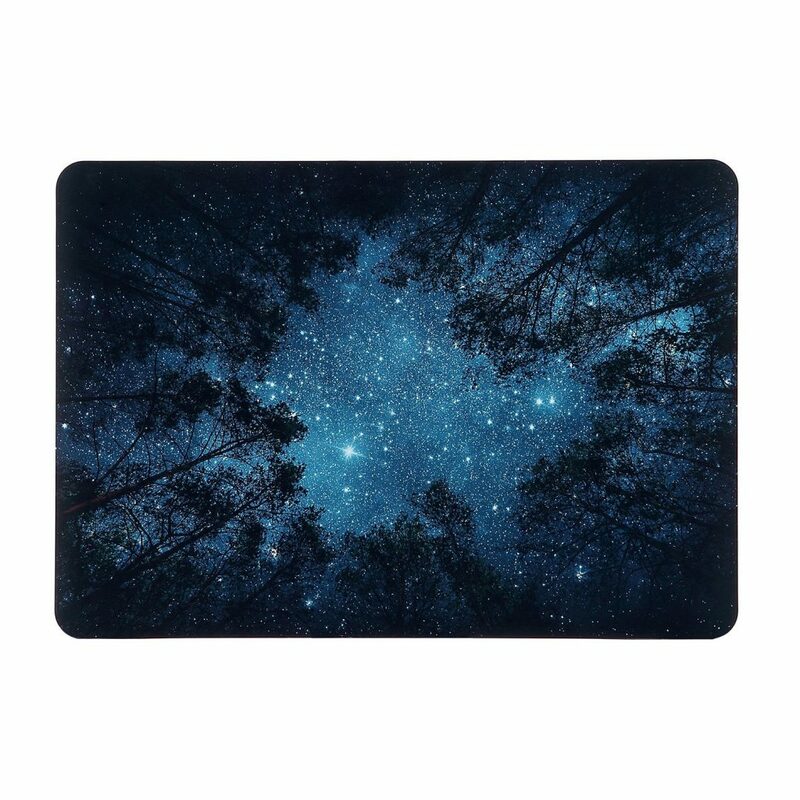 Get this unique customized MacBook Air cover in 15 different prints. Each print is pretty and attractive. It has a simple clip-on design which lets you install the cover on the laptop easily. 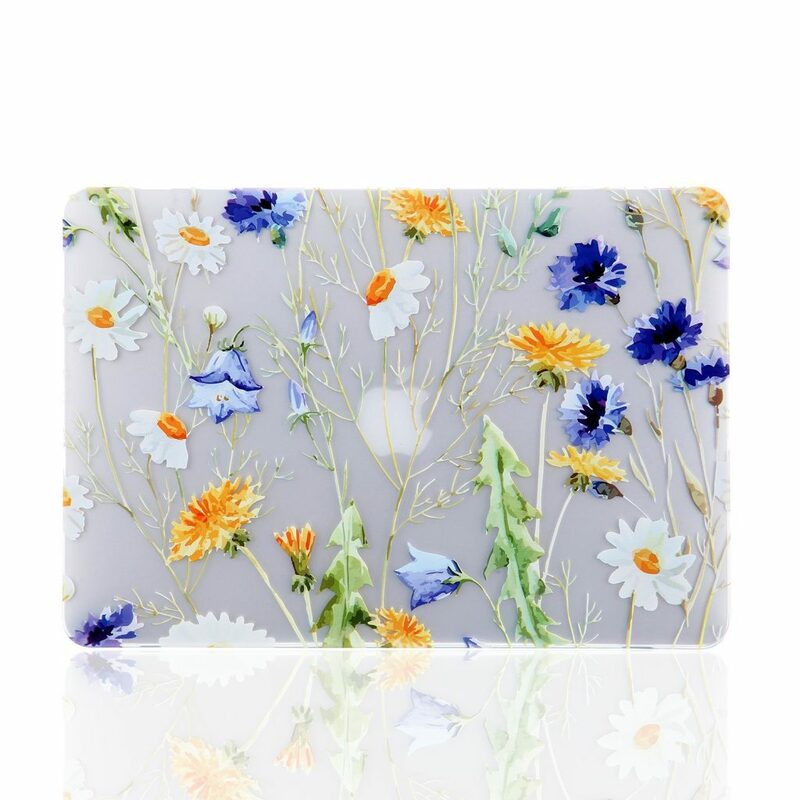 This hard case has a glossy print and makes your laptop look quite fashionable. The design is of high quality and the look is chic and sleek. It is made of polycarbonate which is quite sturdy and protects your laptop from accidental shocks or damages. 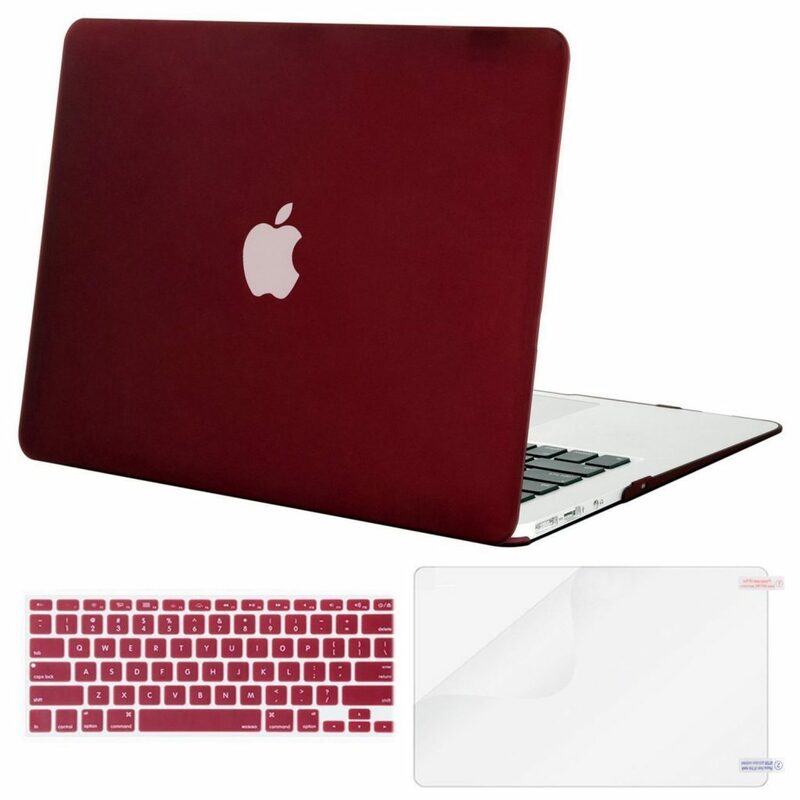 This MacBook Air case comes in solid colors and you have 8 color options to select from. The case is made of TPU and PC that give it flexibility along with durability. There is a kickstand built-in the case which you can use to adjust your laptop for better viewing. 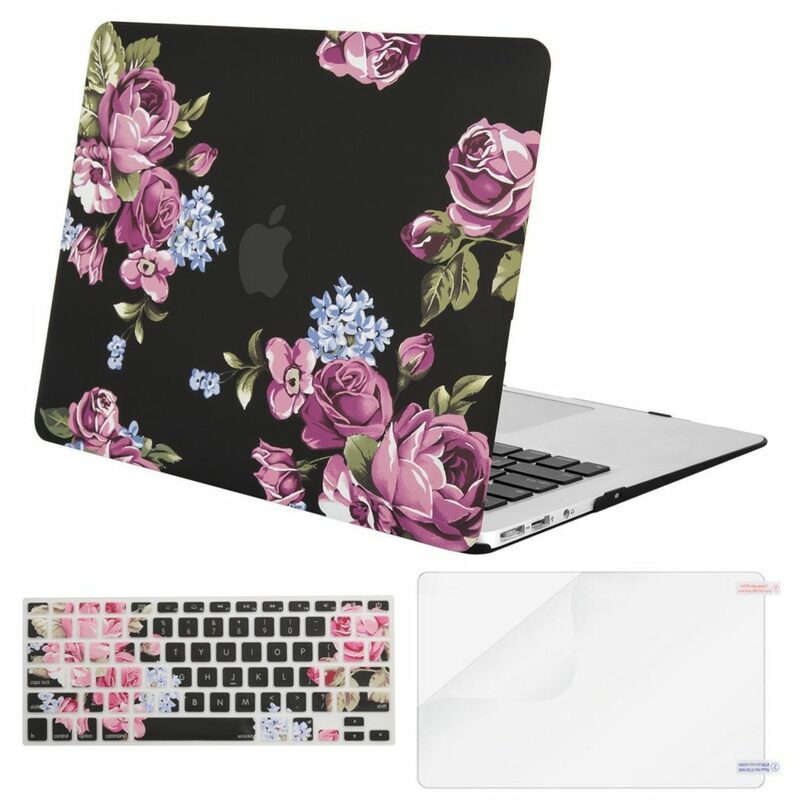 iDonzon offers this unique looking case where you have 5 floral prints and 2 solid colors to select from. 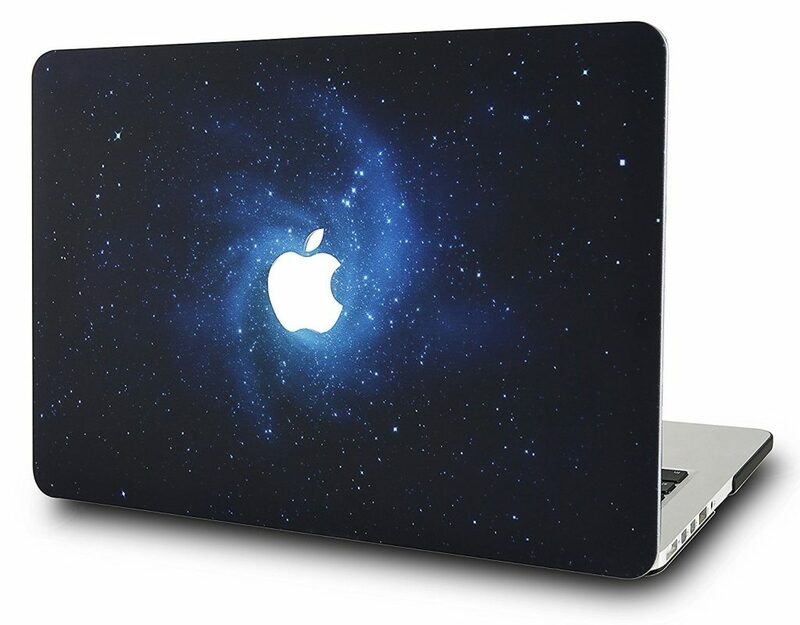 Its transparency lets you seen the Apple logo on your laptop. It has a matte finish and sits on the laptop like its next skin. The cutouts have been accurately made for the vents and ports on your laptop. This is one of the best MacBook Air cases and covers. There are 24 color variants in this case from which you can pick your choice of color. You get a matte finish hard shell for the laptop back and a keyboard cover of the matching color. Along with this protection, you also get a sleeve for you to store your MacBook Air. This case has been exclusively fashioned for MacBook Air. The case is made of two plastic pieces. 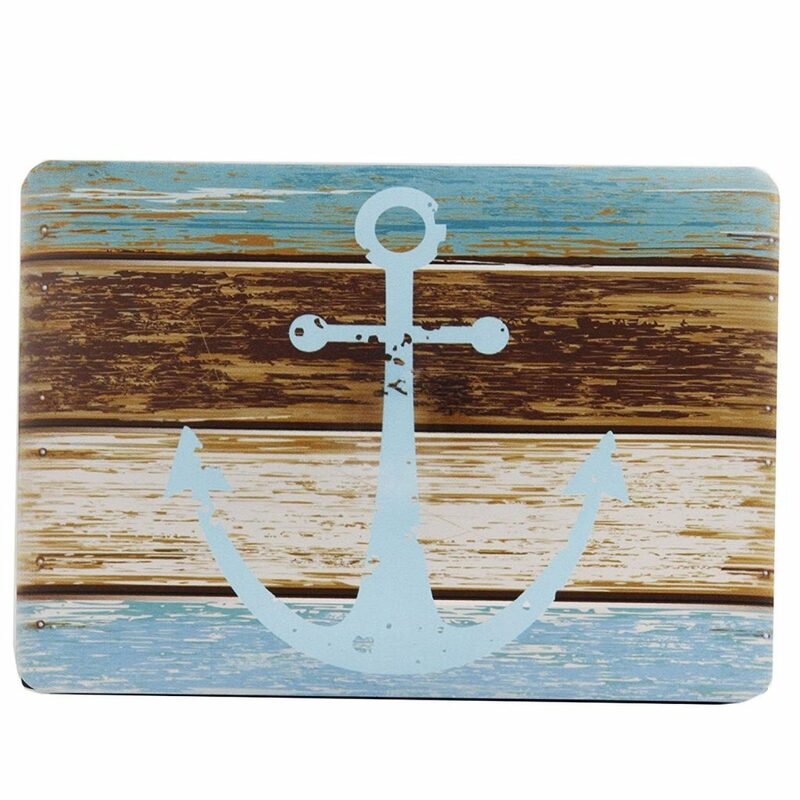 The cover has a rubber oil coating which saves your device from scratches, oil, dust and fingerprints. There are four small rubber feet that hold your laptop in place while you are working on it. 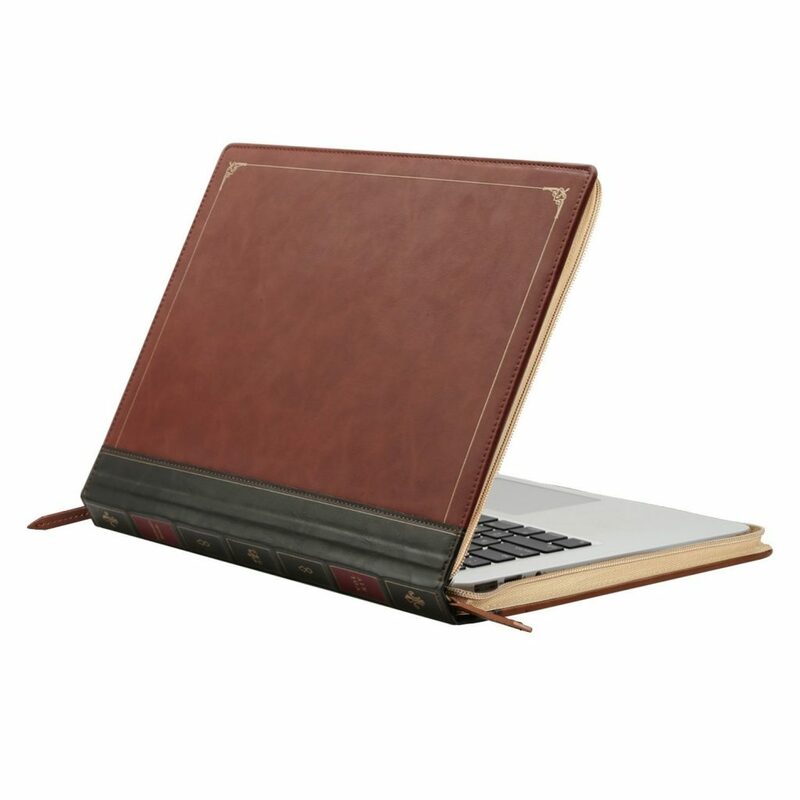 Next in the list of best MacBook Air Cases and covers is this beautiful case from BELK. 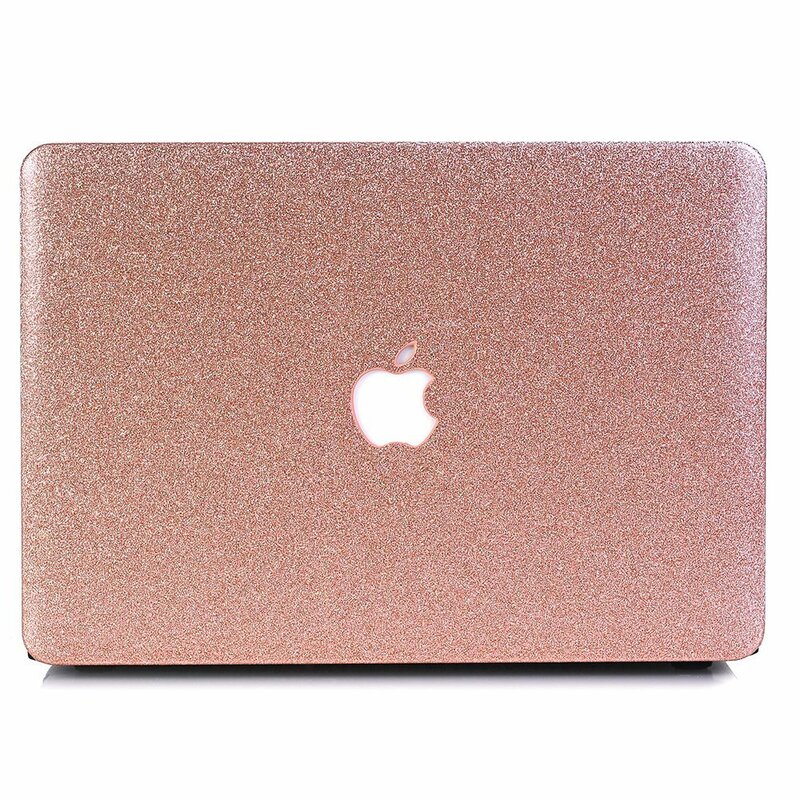 This is a fashionable case with glitter which makes your MacBook look quite attractive. Installing it on the laptop is quite simple and it gives you access to all the ports. It is made of premium plastic which gives complete protection to your device. There are 35 different designs and colors to pick from. This lycra bag from Mosiso comes with an inner padding and soft lining of fleece which gives protection to your laptop in case it faces any accidental bumps or shocks. The case also comes with an additional pouch which you can use as a storage for the laptop charger, earphones or anything that you like to carry in it. This is a two-piece snap-on case for your MacBook Air. It comes with different stylish designs. There are four rubber feet at the bottom of the case for grip and support. All the 8 options that you get are unique and look pretty. You don’t need to take off the cover to charge the laptop. There are proper cuts outs made from which the ports can be accessed. There are 39 shades and prints available in this shell case. The Apple logo shines through the case when your laptop is on. It is beautiful and very light. It adds a layer of protection to your laptop without adding any extra bulk to it. This is an ultra-thin sleeve case which comes with a stand. 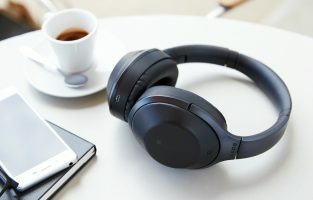 The unique design lets you play games or watch videos from your comfort angle. The space created between the laptop when it is on the stand lets the heat escape quickly. It is made of synthetic leather and comes in black and navy blue. 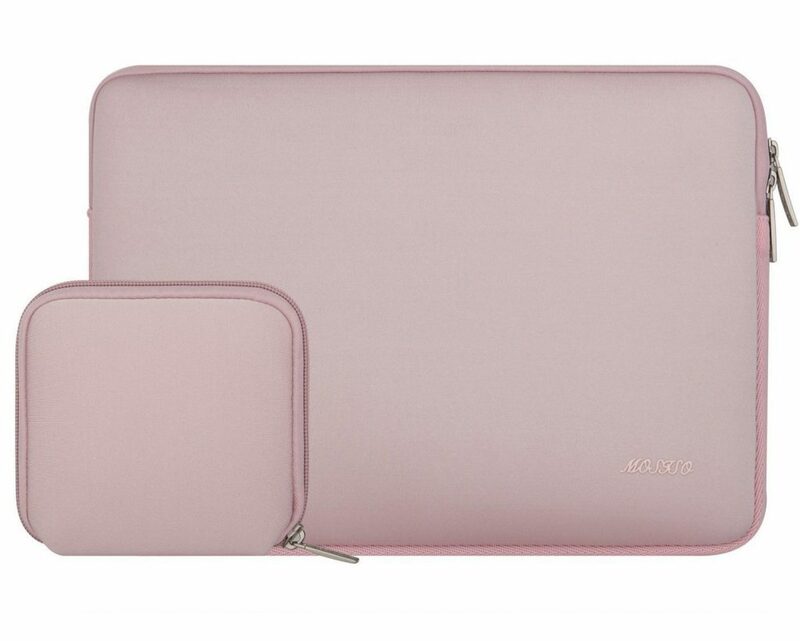 This padded case from CCPK comes in three colors and is made especially for MacBook Air. The zipper comes with a closed seam and keeps your laptop safe in the sleeve. 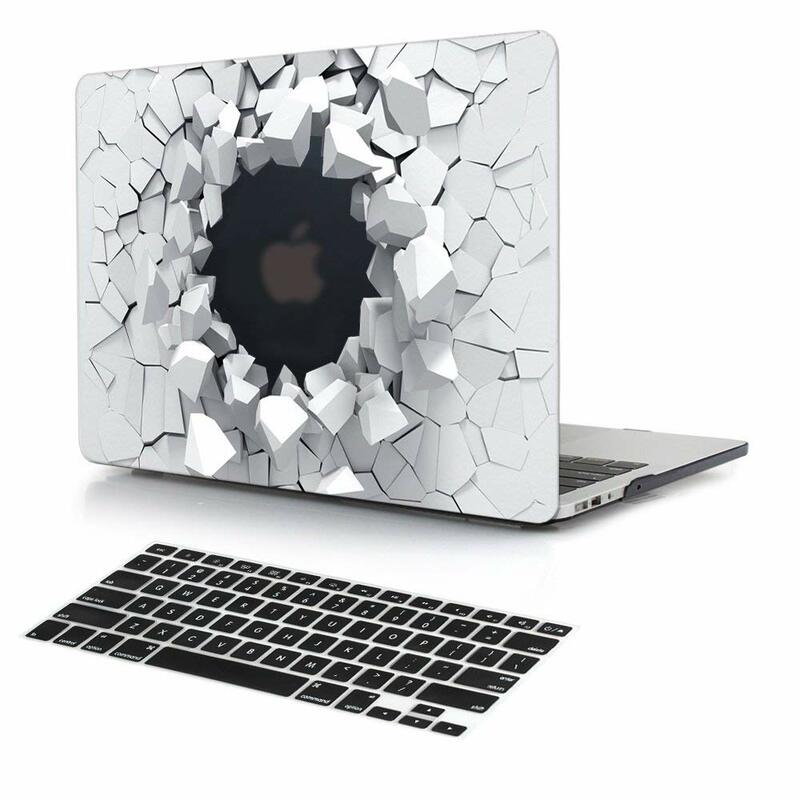 This is one of the coolest MacBook Air cases and covers. You get a rubber coating laptop cover, a keyboard cover and a pouch bag to carry your laptop bag in. The pouch is made of felt and very soft to touch. The rubber case of the laptop provides complete protection against all types of wear and tear, dust and dirt. 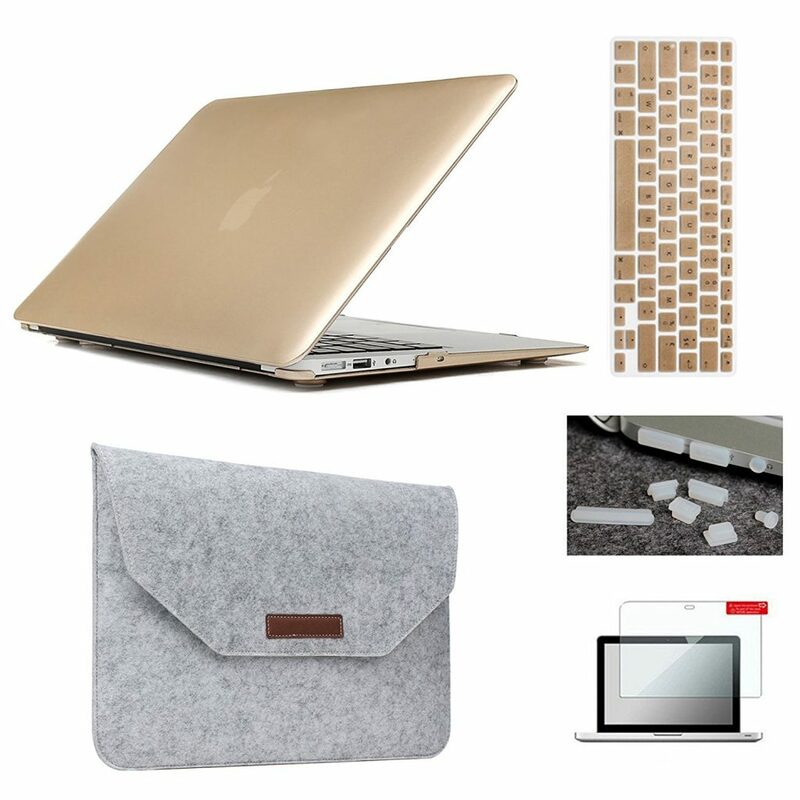 This is one of the best MacBook Air cases and covers that will protect your laptop from scratches, wear and tear etc. This is a beautiful PU leather made cover which has excellent shock absorbing features. It has a vintage look and enhances the beauty of your device. 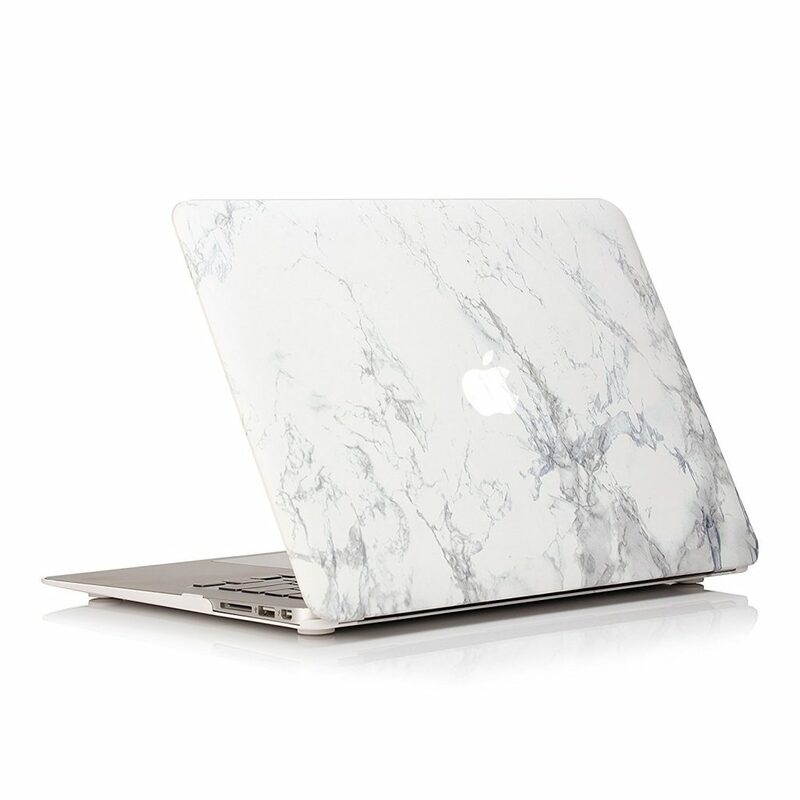 This classy marble look case comes in six unique colors. Its high-quality coating gives protection to your laptop. There are four non-slip pads on the case which keeps your laptop from slipping. 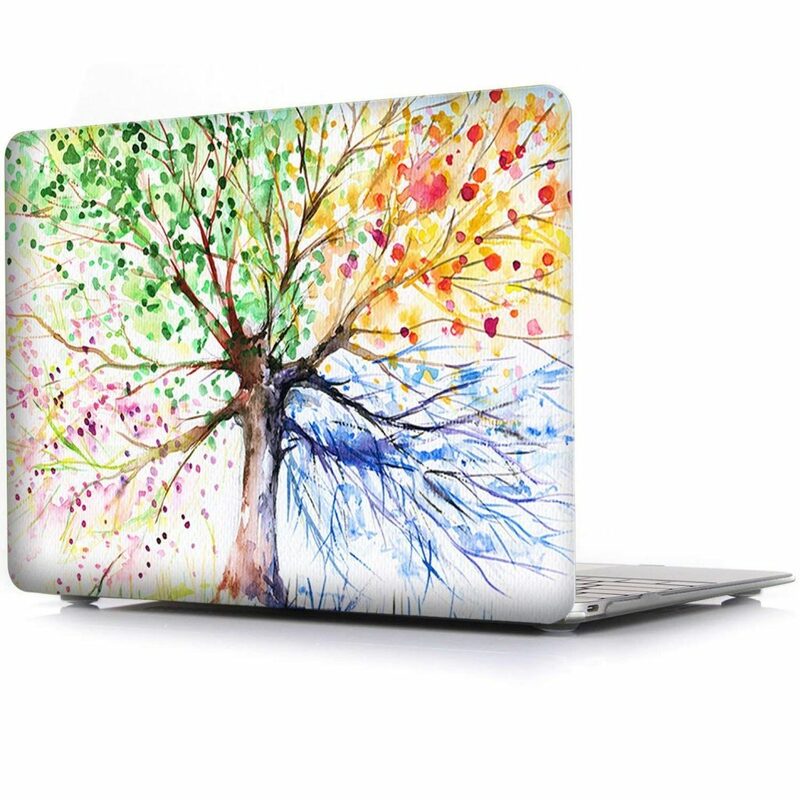 This is the best way to protect your laptop and make it look beautiful. This beautiful matte finish case doesn’t get any scratches. 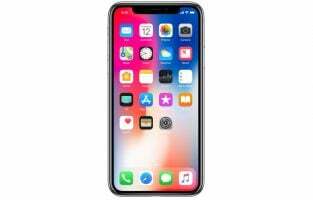 It has a see-through design from which the Apple logo can be seen. The clamps on the case once attached keep your laptop safe from spills, oil stains, fingerprints, scrapes etc. The cutouts in the bottom provide it proper ventilation so the heat can dissipate. 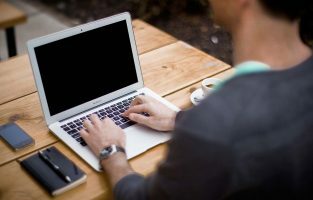 With various types of MacBook Air cases existing in the market, you may want to consider a few things before you opt for this accessory. If you want a truly rugged and hard case, you may look into the different two-piece cases available. Choose from one that can be easily fitted and removed, as well as does not slip off the surface on which you will be placing your laptop. You can decide between a plain case that comes in solid colors or a case with a printed top panel. However, make sure that there is provision for air circulation so that the MacBook Air does not get heated. Alternatively, if you do not want to fit anything to your laptop, a sleeve may be the best bet. Take your pick from one that comes with just one big pouch or one with two or more pouches so that you can keep your laptop and its related accessories separately. It is advisable to look for a sleeve that fits into your backpack, bag or briefcase without making it look bulky.